It is my great pleasure to be part of Carlie Cullen’s blog tour. The first part of a paranormal romance trilogy, this debut novel will blow you away. Giveaways to celebrate the launch will run from 8-31 October. It’s still not too late to enter! 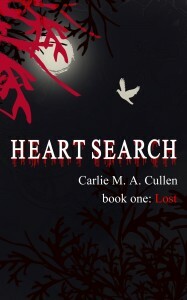 For further details, please visit http://carliemacullen.com Excerpt of Heart Search … Continue reading "Carlie Cullen’s Heartsearch Blog Tour – Book One: Lost"